For centuries, disputes in Japan were characterized by small tribal battles. It wasn’t until the twelfth century, after the Mongols had been repelled, that armies grew to massive sizes and true war took place. This was the start of the Feudal period. Daimyo and Shoguns led their armies onto the battlefield and waged war on one another in attempts to install their own government. As is always the case with war, money played a huge role. Consider for a moment, the type of operation you’d need in place to march an army of thousands of soldiers several hundred miles to do battle. Of course, you’d need to make sure each warrior was armed, and ideally they’d also have some sort of armor. However, you wouldn’t want to march them for days, just to have them collapse on the battlefield from hunger and exhaustion, so you’d need to ensure they were able to eat and get rest as well. All of this is not cheap and you quickly begin to see what an expensive endeavor war is. At the start of each Season, a certain number of Japanese regions are revealed. These are the locations where war will take place at the end of the round. Battles will be won or lost with the forces players are able to assemble. They can call upon Bushis, Shintos, their Daimyo, and a wide assortment of monstrous figures pulled right from Japanese mythology. During the Season, players have time to muster their forces and prepare for battle, or to see the coming storm and get out of the way. By knowing where and when the battles will take place, there is a slowly growing intensity to the coming resolution. You will start to see the importance of standing your ground in certain confrontations, or turning tail and running. “I wanted a game that was very Cold War-like,” says Eric M. Lang, the designer of Rising Sun. Politics are intertwined into every aspect of the game including the combat. When your forces are involved in a battle, you have four different options to invest your money in to. Anticipating what your opponents may want can lead to some creative bluffing or to a negotiated deal. Diplomacy plays a huge role in Rising Sun, and players are freely able to discuss where they intend on investing their money in a battle. Agreements can be made and equitable solutions found. Of course, you’ll never know if you’re able to trust your opponents until the bidding is revealed. The first choice is Seppuku. You kill all of your forces in the region and gain honor for each of your figures killed in this fashion. This is an excellent option if it looks as if you won’t be able to survive the battle and you want to save some face. Taking a Hostage is the second choice. This allows you to remove an opponent’s figure from the board, and lets you to steal victory points from them in the process. Your opponent will have to pay a ransom if they hope to get their soldier back. The third option during a battle is to add your Ronin tokens to your forces already on the board. These tokens are gained throughout the game. Ronin were samurai warriors without a master. They were hired swords, willing to fight for anyone… for a price. Hiring an Imperial Poet is the final option for how you spend your money in a battle. Great battles are all about the way they’re remembered in history. For that you need a poet. The winning bid will earn that player victory points for each figure killed in the battle regardless of their clan. After the last battle action is resolved, the player with the strongest force in the region wipes out everyone else. The trick is that for each different battle that occurs, players will assign their bids secretly. They may try to win all four of the different battle actions, or put all their money on one. However, over the course of a Season, there will be several battles. If you’re involved in more than one, you may want to be careful how you spend your money. “It was important for the war to feel as diplomatic as the political phase. The only difference is the consequences are death,” says Lang. However, it’s been his experience through the play testing process that even the battles are usually quite polite. The battle system requires players to be thinking several moves ahead, but the results are not determined by the roll of a die. Rather, they require the deftness and careful planning of a true leader. Nothing in Rising Sun happens by chance. It wouldn’t be an Eric M. Lang and CMON game without some pretty cool monsters to add to the fray. Throughout the course of the game, players will be able to acquire creatures pulled right from the pages of Japanese mythologies to aid them in their conquests. There’s the River Dragon, the Komainu, and a number of different spirits, like the Oni of Blood, or the Oni of Skulls. Each monster is represented by an incredible, highly-detailed figure. Once they’re placed on the board, opponents better beware. Used effectively, these monsters can swing the tide of a battle. Rising Sun offers a remarkable gaming experience. It is a balancing act between war and partnership for the players. Sometimes the carrot offered is diplomatic relations, at other times a more pointed stick and violent tactic is required to get your way. Everything in the game is tied together, including Lang’s unique new battle system. The key is to find a peaceful solution, until you’re ready for war. Rising Sun launches on Kickstarter on March 7th at 3 PM EST. 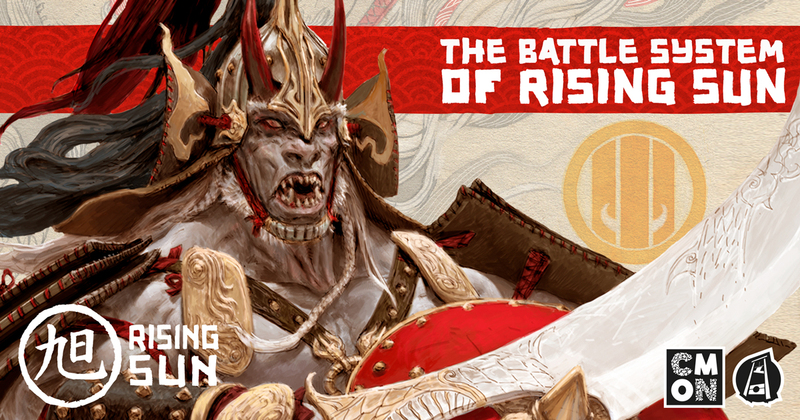 Read our overview of Rising Sun here. Learn more about Diplomacy in Rising Sun here.